It seems Regina butcher Greg Reid “gets” social media. 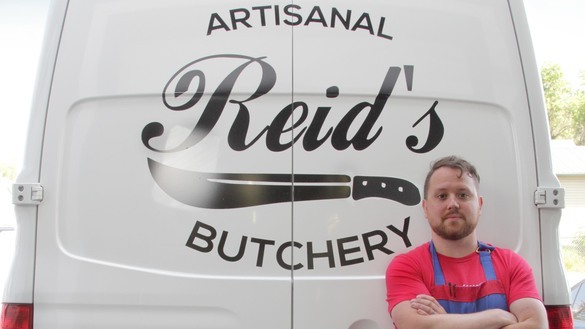 Reid, of Reid’s Artisanal Butchery, purchased a refrigerated van to gather and distribute product for his local, ethically-sourced animal protein business. So he decided to encourage people to post photos of his “Meat Limo” on social media if they spot it in their town or neighbourhood. “Our hashtag is really blowing up—people are taking pictures of the Meat Limo everywhere they see it,” says Reid, a butcher, chef and self-proclaimed family man. Reid is an entrepreneur with a passion for local food. Born in Newfoundland and raised in New Brunswick, he first moved to Regina in 2005 and returned to the city from Vancouver to look for an opportunity that matched his food skills and training. He found it. “I saw a need in the market to open an artisanal butchery business because there was no one who was doing it, in my view, and no one was promoting it.” Market research and experience in bigger centres gave him confidence to bet on the notion Saskatchewan was ready for locally sourced meat from ethically treated animals. He launched his company in 2016. With help from a couple of butchers in rural Saskatchewan who help him source and slaughter his beef, lamb, pork and poultry, Reid prepares a wide variety of cuts, including some that consumers are not likely to find in the meat section of their local supermarket or even in traditional butcher shops. Part of the reason for that is because he believes in using the entire animal. And that means popular beef cuts like tenderloins are not always available to customers who purchase his products through Regina’s Local & Fresh online grocery service or at Regina Farmers’ Market on Wednesday and Saturday mornings. About 60 per cent of his business is Regina restaurants, including The Willow on Wascana, Crave Kitchen + Wine Bar, The Fat Badger and Cathedral Social Hall. Reid understands his family requires a well-rounded, balanced diet. Meat is served at the Reid household about three nights a week with the remaining meals focusing on vegetables, pulses and other plant foods. But Reid is an animal protein diehard. “I love meat. I can’t foresee a situation in which I don’t eat meat.” He’s banking on many others feeling the same way.